"We will stop those blasted swabs!" With the massive success of Pirates of the Caribbean and Master and Commander, suddenly films about life on the high seas are all the rage, and it seems like sense then a slew of classic adventure films have been released on DVD. Sometimes this is a good thing and a lost gem comes to our favorite format for the first time, and in other occurrences you get motion pictures that should have stayed in the vaults. Sadly, Pirates of Tortuga belongs in the latter category. 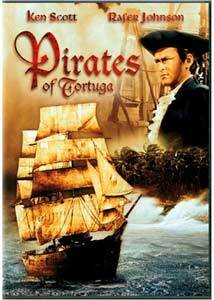 Captain Bart Paxton (Scott) is called upon by British royalty to stop Sir Henry Morgan (Stephens), a pirate who is quickly closing in on small colonies. While this would have been enough to base a compelling film upon, the script seems to feel it necessary to include a feisty street smart woman named Meg (Roman) who stows away on Bart's ship. Soon the chase to find and stop Morgan is interrupted with the officers and crew of Bart's ship attempting to win over Meg by training her to be a nice and polite citizen. Before you can say "My Fair Lady meets Captain Blood" things are well underway, until Bart and Morgan become allies and a rather unpredictable, yet ridiculous, conclusion. There is a large part of me that greatly enjoyed Pirates of Tortuga for its unabashed style, taken from the Saturday matinee films that have become a thing of the past. The film excels when it is focused on the pirates on the high seas, but the utterly mind-boggling inclusion of a subplot featuring Meg trying on outfits and attempting to change from a thief into a lady feels like something out of a completely different film. The film also suffers from clumsy direction by Robert Webb, who resorts to what appears to be footage of a model pirate ship in a kitchen sink. What's worse, the ship never even appears to be moving. The film was shot in scope, yet Webb never decides to take full advantage of the canvas laid before him—several of the grandiose scenes are shot in close frames that fail to give the film a much needed epic feel. The lead actors also fail to do a serviceable job in their roles, as each is rather bland in their performances. The largest flaw is the casting of Scott in the lead role, though it is understandable that with the poor quality of the script no top line actor in his or her right mind would become a part of this sinking ship. Image Transfer Review: Pirates of Tortuga is presented with both a 2.35:1 anamorphic widescreen transfer and, on the flip-side, a horribly cropped 1.33:1 full frame image. The source print is the largest problem with the transfer, so the end result in terms of quality is hit and miss. Some scenes do a nice job reproducing the colors with no bleeding evident and above average sharpness and detail. There are times when the print suffers from a dark and grainy appearance that gives the transfer a very dirty look. Edge enhancement is a problem, with numerous occurrences as well as some shimmering in several scenes. Audio Transfer Review: The film is presented with both Dolby Surround and mono tracks. The Dolby Surround track is hardly an improvement over the mono, but it does offer a tad clearer mix that cleans up the dialogue as well as the score. Dialogue is spotty throughout, with some distortion as well as harshness. The separation of the left and right speakers is nonexistent and the surrounds are mute. Extras Review: There are no features included. There exist films that are fun and packed with the sort of excitement that not even the best Saturday matinee's can offer. Pirates of Tortuga is most certainly not one of those films. I applaud Fox for offering yet another older film with such a capable transfer—too bad the film is just a wreck.